In the previous post I told you how I installed Java on my production server. 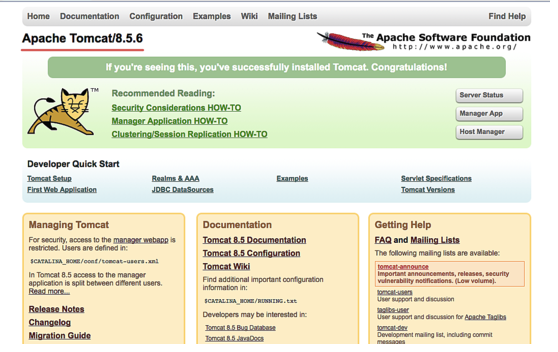 Now it’s time to install Tomcat. There are different ways you can do it. I must warn you that the way I did it might not be the best way, because I skipped all the security related steps. So, what you are about to read is not a definitive guide to Tomcat installation (if you are looking for that kind of guide check out this article). But I think this post can be a good starting point for a complete noob who doesn’t what to overwhelm himself with too much detail right from the start. Here we’ll just focus on installing Tomcat and making it work somehow. Also don’t forget to configure your ports. More on this later. Before making my second attempt to install Tomcat I found a video tutorial, and went through it step by step. We will go through this tutorial later in this post, but before installing Tomcat we will need to setup FTP server. I’m sure there are other ways to transmit installation file to the remote server, but we will still need the FTP server later on for uploading our apps. So why not start with FTP server? I’m not sure if the second line was necessary, because I didn’t quite understand the tutorial. Did I need to install ftp on my local machine or was it needed on the remote server? I just thought it wouldn’t hurt to install it also, so that’s what I did. On my local computer I have FileZilla, which I installed a long time ago, so I used it to connect to the server. Now you can open FileZilla, specify url of your server, your name and password, and try to connect. It is going to connect, but it will throw an error soon after. The reason is that the actual data is transferred through a range of ports which are all closed in your firewall. The port 21 is just for the commands. For all the data you need to open some other several hundred ports. Also you need to tell the FTP server which ports it should use. What we did here is we enabled the passive mode (read about it in the articles above) and set the range of ports that FTP server will use for transmitting the data. We need at least several hundred ports. Then, using FileZilla, I uploaded it to my server. Now the file was in my home folder on the server. The reason I used specifically zip file instead of tag.gz is that that’s what was used in the video tutorial. I decided to not change anything. I think tag.gz would do just as well. It means I can execute *.sh files.